Fully-hardy, short-lived, rhizomatous, iris-like perennial with blue-green leaves with a distinct white edge in a fan-shaped cluster, and many-branched stems to 60cm, bearing a profusion of flowers, with white falls, spotted brown-purple, and grey-white standards, faintly striped with purple. Other colour forms are known. The plant often dies after flowering but seeds readily. [RHSD, Hortus, Dykes]. ‘[Iris dichotoma is] the rarest species of its genus in our collections, and marked by more than one striking anomaly. 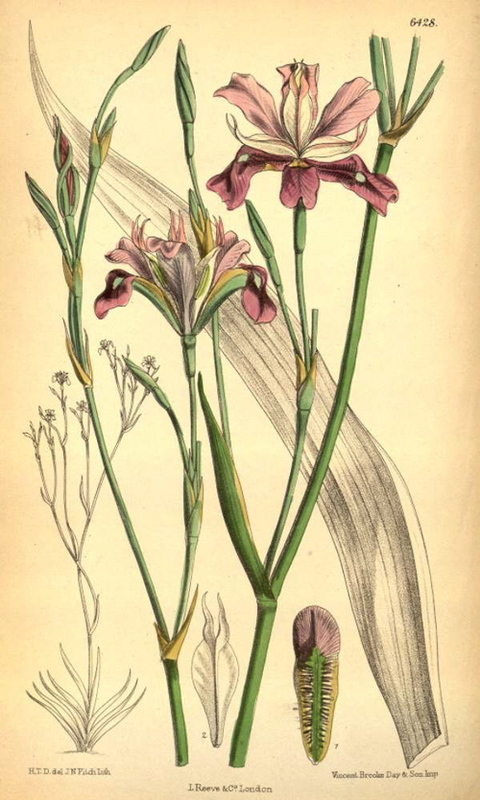 The foliage and stem partake considerably of the habit of those in Pardanthus chinensis, or China-Ixia.’ Introduced to Britain by John Bell in 1784. [BR f.246/1817]. ‘This is a very distinct species of Iris, remarkable for its much branched habit, short spathes and fugacious, rather small bright purple flowers, which expand in the evening, one after another in the same cluster on successive days, after the fashion of Tigridia or Pardanthus. It is a native of the Eastern half of Siberia, and has long been known in cultivation, but it has always been very rare.’ [BM t.6428/1879]. OFG f.262/1854. Listed in all published catalogues [B.232/1843].